During the Second World War the Holy Cross Place air raid shelter had a direct hit during an air raid. Long after the war, in the 1960s my wife Betty and her friend Pat were in Holy Cross Place, which had been rebuilt as new homes. They were in Pat’s Mother-in-law’s masonette. Pat was making a cup of tea in the back kitchen and my wife was in the hallway. They were talking to each other, when my wife said to Pat, ‘Who is standing behind me? !’ She was convinced that there was someone, a man, standing behind her. Pat could not see the man. Betty kept looking over her shoulder to see who was there, she didn’t want to turn around to look, as she felt very uneasy and that there was something not right. She felt that the man was standing right behind her shoulder, almost touching her. He was there for some minutes, during this time she felt rooted to the spot and not able to move. She was terrified. Betty felt that this man was someone who had been killed during the air raid. My wife was a very, very strong woman and was not prone to imagining things that are not there and she was not religious in any way. 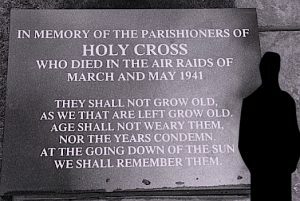 She always stood by her experience, that day in Holy Cross Place, and very strongly insisted that there had been a presence standing behind her on that day in Holy Cross Place. My wife never went back to visit Pat at her mother-in-law’s flat again. A few years later, we met famous Liverpool ghost story writer, Tom Slemen and told him about my wife’s experience. He told us to go to Speke Hall to see if she could pick up any ‘vibes’ there, but Betty didn’t go – it was not an experience she wanted to repeat.